Is it a DIY project? Concrete can be colored in a variety of ways through the use of concrete stains, integral color, color hardeners, or concrete dyes. 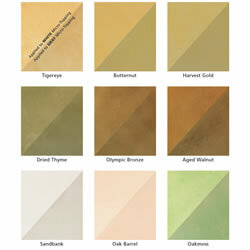 The type of coloring method is usually chosen based on the application where it will be applied. For example, will it be indoors or outdoors? Some colors are not UV-resistant. Are neutral tones desired or brighter, more vibrant tones? 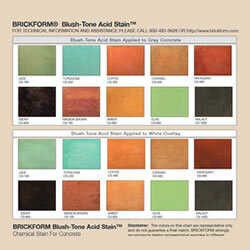 Stains will impart more naturally-colored neutral tones, whereas dyes will give brighter coloring. 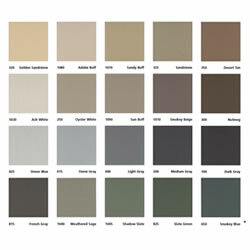 Many manufacturers offer a variety of color choices. 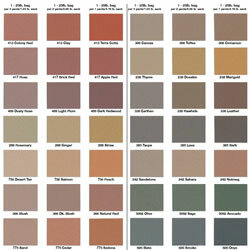 Here are a few resources to give you an idea of the range of color possibilities. For more color scheme ideas, view the stamped concrete photo gallery. Copyright © 2010-2015 StampedConcrete.org. All Rights Reserved.